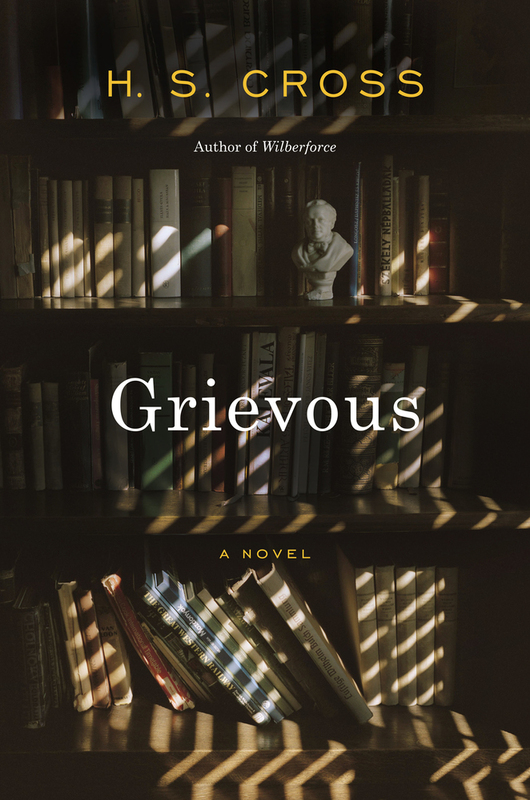 The Page 69 Test: "Grievous"
H. S. Cross was raised in the waspy suburbs of Detroit, attending co-ed day schools, doing children’s theater, sailing, riding bikes, collecting Garfield paraphernalia, and afraid to kiss boys. 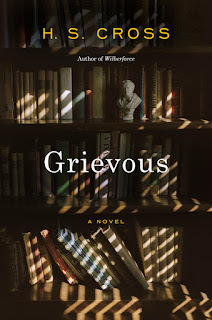 It therefore follows that she has written two novels set in the 1920s and 30s at an austere English boarding school for boys, Wilberforce and the newly released Grievous. —What’s going to happen, sir? —You’ll have to tell me everything, John replied. —I mean Trevor. Is he . . . ? The boy still didn’t look at him but turned instead to the door, as if his friend stood just outside. —Kardleigh’s with him. He said you’d done a commendable job with the first aid. —Thomas, John continued, please start at the beginning. I can’t help until I know the facts. A deeper scowl. John thought he heard teeth grinding. He could wait. Not long, but some. He would sit beside this boy and wait on the light. He would use the Christian name, which he hadn’t used with this one in years. This bone-crushing person beside him bore little resemblance to the child who had first entered his study, too young for the school but enrapt nearly as much as John had been by the woman accompanying him. John remembered thinking the mother was too young to be a widow. The war had produced a nation of them, but even though ten years had passed since then, this woman, girl, wore black head to toe, looking lost and fierce, as if she, not the boy, were being dispatched. He remembered thinking she needed a governess. He remembered, when she spoke, how much it seemed like playacting, as if she’d raided the dressing-up box. He remembered the monologue she embarked upon, concerning the boy’s hair, its streaks of yellow and brown, yellow from her, brown from his father, neither color winning the battle but flecking side by side in brindle—as if she were describing a stray dog. John remembered thinking her prattle a charming form of hysteria, and he remembered inviting the two to sit and drink the tea Mrs. Firth had provided while he stepped across the quad. Jamie was in his study with his secretary, and John unleashed in front of them both. Lewis had tried to wheel himself from the room, but Jamie had told the man to stay as he was. He told John that since Riding was here now, he couldn’t be put out at the gates. End of discussion, good day, where were we, Lewis? John knew he’d left the boy and his mother alone too long, and as he strode across the cloisters, he remembered thinking, She’s too young to manage; he remembered thinking, They’ll eat him alive. And then he remembered Morgan Wilberforce. Stylistically, page 69 is a good representation of the book. We’re in the middle of a scene between John Grieves (housemaster and title character) and his student Thomas Gray Riding. Gray is on the verge of being expelled—because of a night prowling incident in which his friend, Trevor, was injured—and John is trying to figure out what happened so he can advocate for Gray with the Headmaster. We’re in John’s point-of-view here, with dialogue (styled with em-dashes) and direct access to John’s thoughts. We’ve just come from Gray’s point-of-view on the previous page, in which Gray is frantically rehearsing how he can lie his way out it. Alternating points-of-view is a major feature of Grievous and gives the reader a privileged view of the characters’ cross-purposes and misunderstandings (both tragic and comic). I was surprised by how much the page’s content also represents the novel. John and Gray’s relationship is arguably the central one, and this scene is where it begins decidedly to fracture. John’s memory of the day Gray arrived at the Academy in 1928 (three years earlier) also presents the origin of their acquaintance: the way John feels Gray was foisted on him by the Headmaster, Jamie; how bizarre the arrival was, in the middle of the school year and Gray two years younger than the youngest boys; the moment John decided to ask Morgan Wilberforce (protagonist of Wilberforce) to mentor Gray, another key relationship. As a bonus, we get John’s memory of Gray’s mother, Elsa Riding, and while he has not seen her since that day in 1928, their relationship develops later in the novel. Elsa herself eventually enters as a point-of-view character, and her widowhood and grief destabilize Gray’s home-life. Visit H. S. Cross's website. Writers Read: H. S. Cross. "Chronicles of a Radical Hag (with Recipes)"
"Professor Chandra Follows His Bliss"